When the new tax laws were instituted at the end of 2017, many segments of the United States population were considered. There were a number of new laws designed to make the fiscal environment for corporations more attractive. Homeowners and parents saw changes in their deductions, as did residents living in states which allow for property tax deductions. According to tax law experts, retirees will be most affected by the increase of standard deductions (offset by a reduction in personal exemptions), and the property tax changes. Most IRS regulations regarding Individual Retirement Accounts were spared as retirees waited with bated breath to see if any of their IRA rules were going to be altered. Spectrem’s new study into the relationship between governance and investors displays the reaction retired investors have to the changes in the tax laws and the nation’s political climate. Politics, Taxes and Investors’ Changing Attitudes asked investors about the new tax regulations and their opinions regarding the partisan state of American politics in 2018. It is one of the more interesting aspects of the new tax laws that many segments of the population are uncertain about its impact upon their own investment decisions and portfolio value. Thirty-five percent of retirees expressed a negative or very negative view of the new tax laws, while 43 percent expressed support for the measures. Twenty-two percent straddled the fence, admitting they were unsure about the impact of the new tax laws on their own financial situation. 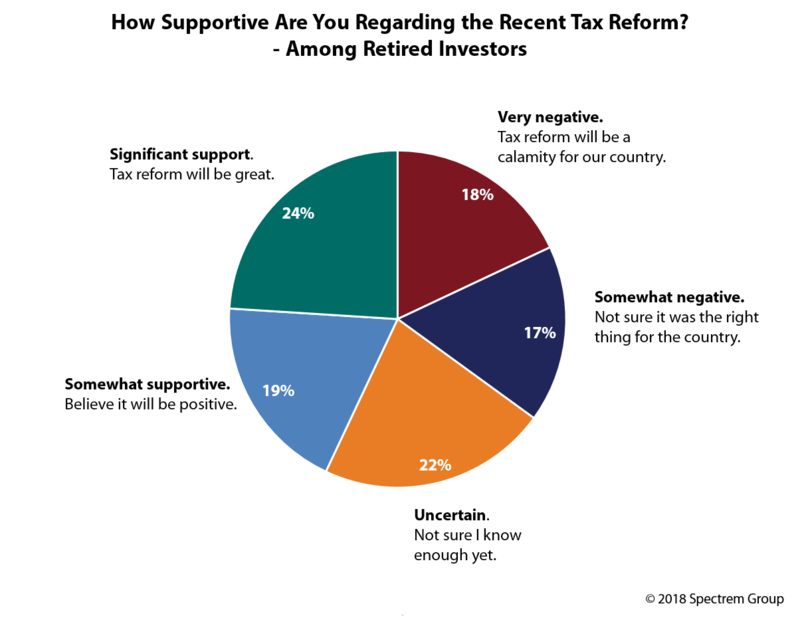 A similar split of responses came from asking whether the new tax laws will increase or decrease their amount of taxes retired investors pay. Thirty-three percent of retirees said they anticipated a decrease in their taxes, 28 percent predict an increase and 20 percent said they had no idea how to answer the question. For advisors, this is a topic of further discussion and review. As the IRS investigates the new regulations and how to implement them, investors can find their taxes change from one year to the next. Advisors can help investors understand how the new taxes laws will impact them in years after 2018. The tax laws came about as part of the control the Republican party has over the White House and the Congress. Despite that majority of power, every major decision Congress or the White House makes faces the potential for disagreement and extensive negotiation in a Washington environment that has been described as “toxic”. Politics is a topic that many Americans follow vigorously these days, and retirees are much the same, even though many topics of discussion in political circles have little effect upon their lives. In the Politics and Taxes report, 54 percent of retirees say they pay more attention to politics today than in the past. Of those, 42 percent say they want to see what the Trump administration and Congress can achieve, while 33 percent say they hate the current administration and watch to see if its initiatives and legislation fail. The partisanship of the U.S. Congress and much of the governance around the nation has heightened in recent years. Because many of them are among the oldest Americans, retired investors have seen politics change over time. The current atmosphere in Washington, D.C. is different than most times in the recent past, and retirees note that. Eighty-seven percent of retirees said they disapprove or strongly disapprove of Congressional representatives voting only along political party lines rather than considering their own constituents and the possibility of working across the aisle for more bipartisan actions. Only 6 percent of retirees state approval of such political behavior. Because Congress and the White House can impact investments and portfolios, sometimes in radical ways, it is necessary for advisors to watch the headlines and to know how investors are going to react to moves which might be interpreted as either conservative or liberal. Advisors are not prying when they ask advisors how they feel about politics; they are acting prudently to know how investors are going to want to invest based on political behaviors.